Tether took $300 million USDT out of circulation, is this evidence of collusion? Preceding Tether’s instability and massive sell off, Tether pulled about $300 Million worth of USDT from Bitfinex, the exchange which has already been accused of using USDT to inflate the value of BTC. 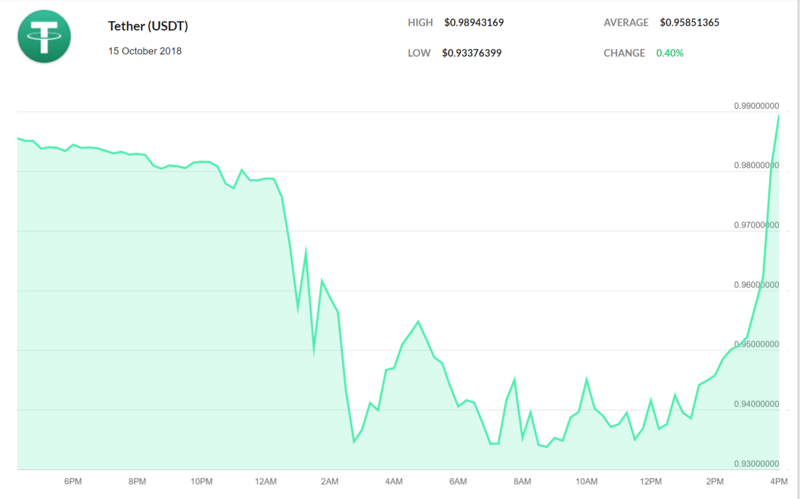 Over the past 24 hours, Tether (USDT) lost its dollar peg in the midst of Bitfinex suspending fiat deposits, resulting in the token dipping below its 1 to 1 value with the USD, its defining feature, which in turn caused a seismic shift in the crypto markets as traders massively sold off USDT and bought Bitcoin in distorted prices, paying a premium of as much as $400 on Bitfinex, covering the difference between the devalued Tether, and a BTC was inflated by the migration. According to Coinmarketcap, Tether is back to $0.98, close to matching the dollar its pegged to, and markets are returning to relative normality. While the crypto market is by nature volatile, Tether is precisely designed to act as a tether (its namesake) in a digital currency storm by retaining the value of one dollar, which makes the price fluctuation and trader flight all the more significant, and surely will not help its already spotty reputation. A number of critics have alleged that Tether is used by Bitfinex to enact market manipulation. Studies point to correlations between large movements in USDT volume and pivotal downturns in the price of Bitcoin, as well as the fact that Bitfinex and Tether share a CEO and CFO. These theories have been refuted by Tether as well as independent crypto commentators, and the fact that USDT acts for many as both an intermediary between fiat and crypto or a hedge on other cryptocurrencies could also explains the historic relationship between USDT volume and BTC prices. Nonetheless, its hard to fully disprove that Bitfinex does not use Tether to pump BTC, and of note is the fact that according to CCN, Tether pulled about $300 million worth of USDT from Bitfinex last week. The tokens were was sent from a Bitfinex official wallet to Tether’s treasury wallet in two separate transactions, and Tether reportedly has also not yet issued $486 million worth of USDT, which it purports to be authorized to. Traders continue to be worried about and frustrated by Bitfinex, who have claimed will be reopening deposits soon, and maintain that there is no problem with withdrawals. Some customers have recently been making contrary claims, noting problems and delays in converting crypto to fiat. Is this evidence of Bitfinex manipulating the market?